Classic Curry!…in my opinion. – One Half Indian. Before I ever met my husband, I made one Indian dish: “curry”. Even when I knew nothing about Indian cooking, I knew that all the heavy cream based dishes I got at Indian restaurants could not be the real cuisine of India. I wanted all the spices, fragrance, and creaminess of the curry from my favorite local Indian place, but without the stomach ache and calories. So, I began to try my hand at my own curry sauce. My basic curry recipe I made pre-Rajat was pretty close to an “authentic” Indian method (as far as I can tell at this point), but it definitely needed some tweaking. 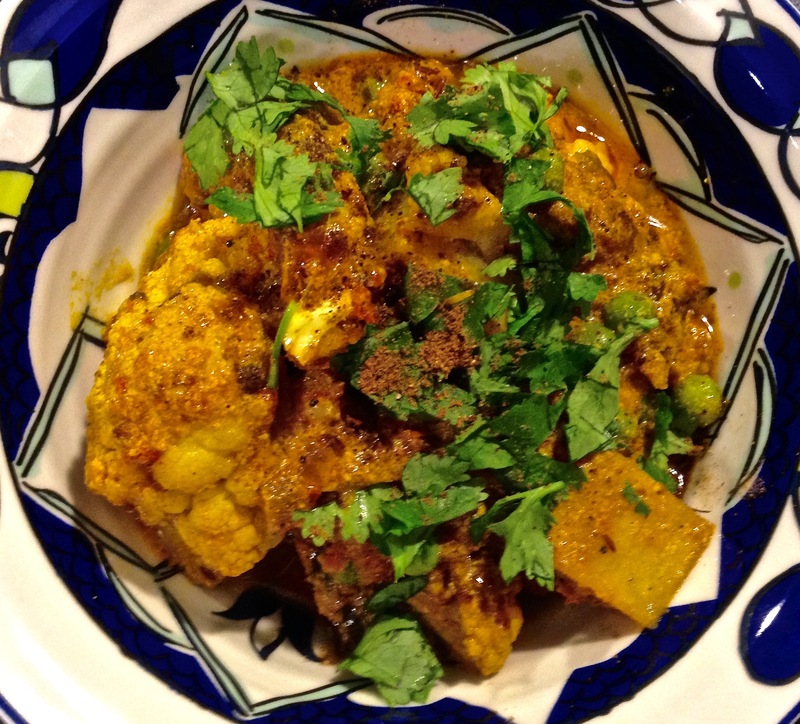 This recipe is the result of several years of American curry cooking mixed with a year of learning to cook Indian. 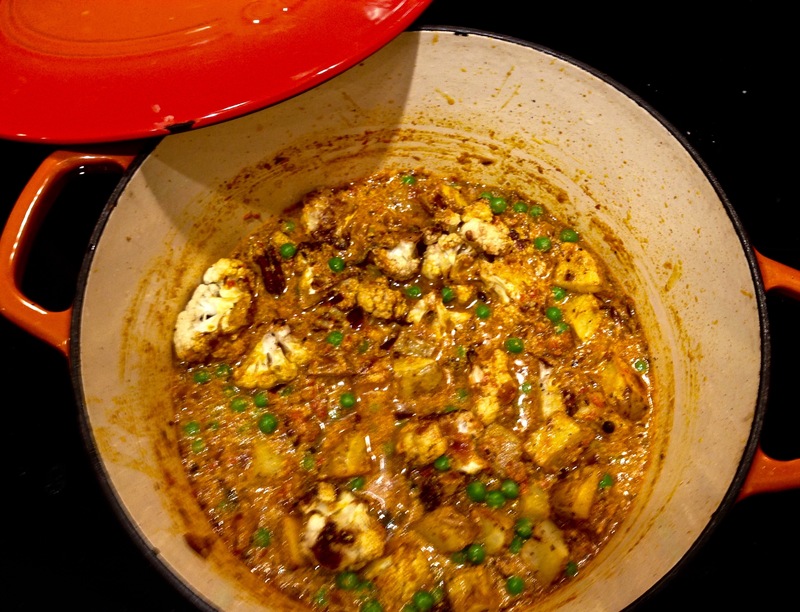 It is definitely what I crave on a cold fall day and is sure to satisfy any Indian food cravings of your every day Jo. Since it has been raining non-stop here in North Carolina, this recipe definitely hit the spot. It warms you from the inside out (that might so creepy, but oh well. it’s true!). Plus, I happened to have all the ingredients for it. In my opinion, this is a great basic sauce. You can put it over pretty much any vegetable or meat. I like it best over roasted cauliflower and potato. This time I added peas also. But this really goes with protein/starch/vegetable you have. In other non-curry yet Indian related news, I have begun studying Hindi with a new teacher, and I am super excited. He tells me to be patient though and that I will only be doing pronunciation exercises for the next seven weeks (that’s right. 7. whole. weeks. ugh.). I guess this is the proper method. Hopefully I can stand it. I am not known for my patience. We have also booked our tickets to India over Christmas. I am counting down the days to finally see this country and the places where my husband grew up! Hopefully I have a few more things to say by the time I go (but at the current rate of learning, it seems doubtful). Enjoy my Classic Americanized Curry. It really is delicious in my (not so) expert opinion. Heat oil and ghee in a heavy bottom sauce pan. When the oil is hot, add the cumin and let fizz and sizzle for 15 seconds. Add the cinnamon and pepper corns. Stir. Add the onion. Stir ingredients. Cook the onion until it it softens and begins to brown on the edges. Add the chopped chili pepper and ginger. Stir and cook a few more minutes being careful not to let the onion get too brown. Add the turmeric, chili powder, and coriander powder. Stir and cook one minute more. Add the pureed tomatoes and garlic. Stir ingredients and cook on medium-high heat. Cook until moisture is out of the tomatoes and paste is left. You should be left with a loose paste like substance and the oil should separate from the tomatoes. Add two cups of water. Add salt and pepper. Stir all ingredients together and bring to a boil. Cook on medium high to high heat until the curry is the desired consistency. I cooked mine for about 20-30 minutes. Once your water has cooked out and the sauce is the right thickness, remove from heat. Let the pan cool for a few minutes so it is not boiling. Slowly whisk in the yogurt. If the sauce is too hot or if you go too quickly, the yogurt may curdle. This won’t ruin your sauce, but I prefer when it does not happen personally. Once you have whisked in the yogurt, put the pot back on a very low heat. Gently warm the sauce. Avoid letting the sauce simmer or boil as this will curdle the yogurt. Add your meat or roasted vegetables. I prefer to add cauliflower and potato that I roast at 400 degrees for 30 minutes. I toss the vegetables with some olive oil and salt and pepper before roasting. I also added some frozen peas I had thawed this time. The combinations are endless! Serve with rice or naan. Top with chopped cilantro, garam masala, and some lemon juice.